Here we are again in another lovely venue. 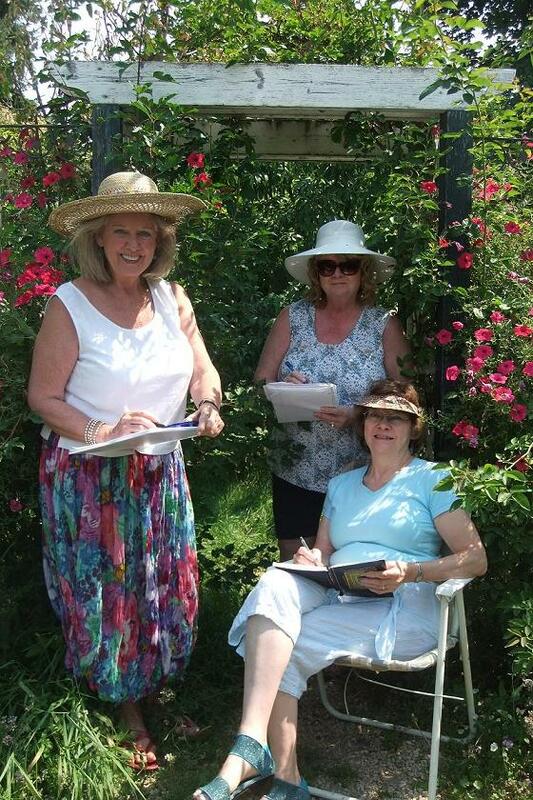 Just Patricia, Miss P and Gayle sitting and writing in a cozy, shady corner of the back garden. Sounds? The whirl, whirl, whirl of an irrigator watering a nearby field; a dog barking in the distance; the occasional lowing of cattle in the adjacent field; the clatter of dishes from the Country Tyme kitchen; the steady, low chatter interrupted by louder laughter from restaurant guests sitting around tables scattered throughout the restaurant garden; the dampened whiz of cars driving past on Kalamalka Road. Smells? Luckily, no cow manure; just the overwhelming aroma of ham, bacon and maple syrup. Though it is already 10:30 a.m., late risers are still having breakfast and brunch seekers are arriving. It is tempting not to think ahead to what promises to be a delicious lunch for us at noon, instead of concentrating on writing. Feelings? Caressed by soft breezes, surrounded by beautiful flowers and protected by shady trees, I am lulled into a sense of peace, an assurance of God’s presence and inspiration to work on a pressing editing project. Moving from my lawn chair, I decide to take up a wooden garden swing close by and begin editing a prayer walk for October’s Southern Interior Lutheran Women’s Fall Event that our ELW at Peace Lutheran will be hosting. I may be retired from my former position as Program Director and Editor for Evangelical Lutheran Women, but I’ve remained in the program editing track on a volunteer basis locally. It’s nice to be back in the groove in such an inviting setting. This entry was posted in Biographical info, Blogging, Canadian theme, Creative writing prompts, Event, Life, Location Writing, Writer's Groups, Writing, Writing muses and tagged becoming a writer, British Columbia, canadian remembrance, Country Restaurant, Federation of BC Writers, God's presence, Morning Star Newspaper, Nature, Opportunities to write, Program writing. Bookmark the permalink. Wonderful post and excellent photos and do tell me how you got the little photo slide show at the end. Thanks Fran. Glad you enjoyed it. I had to go back into WordPress and redo my post about Location Writing in a Cherry Orchard to remember how to do the slide show. When I had posted that first one, I just didn’t have time to fool around with it and now have updated it to insert 3 slide shows instead of having photos spread all over the place. Thanks for getting me to refresh my memory and redo that post to my satisfaction. Anyway, when you want to insert a number of photos together, first bring in all the photos you want so that they are in your media file but don’t insert them into the post yet. Then go to Media File and click “Create Gallery.” Then click on all the photos you want in the slide show and click “Create a new Gallery”. Then click “Insert Gallery”. You will see “Edit Gallery” come up. Then choose the settings you want for the Gallery. Your choices will be “Link to” (attachment page, media file or none): choose “Attachment page.” Skip choosing the number of columns and random Order. Under “Type” you will have 5 choices so choose the last one “slideshow.” Then click “Insert Gallery”. Don’t worry that the gallery just shows up on your page not looking like a slide show. That will happen when you finally publish the post. Good luck!